Encapsulation of food materials with spray cooling has been a remarkable technology in recent years and is especially used for encapsulating heat and water sensitive active materials. The spray cooling method comprises the dispersion of the active material into the coating material or materials, the atomization of the mixture and the solidification stages. In the food industry, aromas, vitamins, oils and probiotics can be encapsulated by using spray cooling method. Waxes, hydrogenated oils, fatty acids and, proteins and carbohydrates that are good at forming gels at low temperatures are used as coating materials in the encapsulation process by spray cooling. The type and mixing ratio of coating materials are the most important features that determine the encapsulation efficiency in spray cooling as well as in other encapsulation methods. Aromas, vitamins, minerals, oils and prebiotics are mostly encapsulated in the studies where spray cooling method is used. In these studies, the effect of coating material type and ratio on encapsulation efficiency and/or the storage stability of active material have been investigated. In this review study, usability of spray cooling method in encapsulation process and the scope of the studies carried out in the literature have been evaluated. Sprey soğutma yöntemi ile gıda bileşenlerinin enkapsülasyonu son yıllarda dikkat çeken bir teknoloji olup, özellikle ısıya ve suya duyarlı aktif maddelerin kaplanmasında kullanılmaktadır. Sprey soğutma yöntemi, aktif maddenin kaplama materyali veya materyalleri içerisine dispersiyonu, bu karışımın atomizasyonu ve katılaştırma aşamalarından oluşmaktadır. Sprey soğutma yöntemi ile enkapsülasyon işleminde mumlar, hidrojenize yağlar, yağ asitleri ve düşük sıcaklıklarda jel oluşturma özelliği iyi olan protein ve karbonhidratlar kaplama materyalleri olarak kullanılmaktadır. Kaplama materyallerinin tipi ve karışım oranı diğer enkapsülasyon yöntemlerinde olduğu gibi sprey soğutma yönteminde de enkapsülasyon etkinliğini belirleyen önemli özelliklerdir. Sprey soğutma yönteminin kullanıldığı çalışmalarda genellikle aromalar, vitaminler, mineraller, yağlar ve probiyotikler enkapsüle edilmiştir. Bu çalışmalarda kullanılan kaplama materyallerinin çeşidinin ve oranının enkapsülasyon etkinliği üzerine etkisi ve/veya depolama süresince enkapsüle edilen aktif maddenin stabilitesi incelenmiştir. Bu derleme çalışmasında, sprey soğutma yönteminin enkapsülasyon işleminde kullanılabilirliği ve literatürde gerçekleştirilen çalışmaların kapsamları detaylı olarak değerlendirilmiştir. Alvim, I.D., Souza, F.D.S.D., Koury, I.P., Jurt, T., Dantas, F.B.H. (2013). Use of the spray chilling method to deliver hydrophobic components: physical characterization of microparticles. Ciencia e Tecnologia de Alimentos, 33(1), 34-39. Alvim, I.D., Stein, M.A., Koury, I.P., Balardin, F., Dantas, H., Cruz, C.V. (2016). Comparison between the spray drying and spray chilling microparticles contain ascorbic acid in a baked product application. LWT - Food Science and Technology, 65, 689-694. Bampi, G.B., Backes, G.T., Cansian, R.L., Matos-Jr, F.E., Ansolin, I.M.A., Poleto, B.C., Corezzolla, L.R., Favaro-Trindade, C.S. (2016). Spray chilling microencapsulation of Lactobacillus acidophilus and Bifidobacterium animalis subsp. lactis and its use in the preparation of savory probiotic cereal bars. Food and Bioprocess Technology, 9, 1422-1428. Can Karaca, A., Low, N., Nickerson, M. (2013). Encapsulation of flaxseed oil using a benchtop spray dryer for legume protein-maltodextrin microcapsule preparation. Journal of agricultural and food chemistry, 61(21), 5148-5155. Consoli, L., Grimaldi, R., Sartori, T., Menegalli, F.C., Hubinger, M.D. (2016). Gallic acid microparticles produced by spray chilling technique: Production and characterization. LWT - Food Science and Technology, 65, 79-87.
de Lara Pedroso, D., Thomazini, M., Heinemann, R.J.B., Favaro-Trindade, C.S. (2012). Protection of Bifidobacterium lactis and Lactobacillus acidophilus by microencapsulation using spray-chilling. International Dairy Journal, 26(2), 127-132. Desai, K.G.H., Park H.J. (2005). Recent Developments in Microencapsulation of Food Ingredients. Drying Technology, 23, 1361-1394. Gamboa, O.D., Gonçalves, L.G., Grosso, F.C. (2011). Microencapsulation of tocopherols in lipid matrix by spray chilling method. Procedia Food Science, 1, 1732-1739. Koç, M., Sakin, M., Ertekin, F. (2010). Mikroenkapsülasyon ve gıda teknolojisinde kullanımı. Pamukkale Üniversitesi Mühendislik Bilimleri Dergisi, 16, 77-86. Lakkis, J.M. (2016). Encapsulation and controlled release technologies in food systems. John Wiley & Sons, p.116-177, ISBN 9781118733523 Matos-Jr, F.E., Comunian, T.A., Thomazini, M., Favaro-Trindade, C.S. (2017). Effect of feed preparation on the properties and stability of ascorbic acid microparticles produced by spray chilling. LWT-Food Science and Technology, 75, 251-260. Matos-Jr, F.E., Di Sabatino, M., Passerini, N., Favaro-Trindade, C.S., Albertini, B. (2015). Development and characterization of solid lipid microparticles loaded with ascorbic acid and produced by spray congealing. Food Research International, 67, 52-59. Okuro, P.K., Thomazini, M., Balieiro, J.C., Liberal, R.D., Fávaro-Trindade, C.S. (2013). Co-encapsulation of Lactobacillus acidophilus with inulin or polydextrose in solid lipid microparticles provides protection and improves stability. Food Research International, 53(1), 96-103. Oriani, V.B., Alvim, I.D., Consoli, L., Molina, G., Pastore, G.M., Hubinger, M.D. (2016). Solid lipid microparticles produced by spray chilling technique to deliver ginger oleoresin: Structure and compound retention. Food Research International, 80, 41-49. Paucar, O.C., Tulini, F.L., Thomazini, M., Balieiro, J.C.C., Pallone, E.M.J.A., Favaro-Trindade, C.S. (2016). Production by spray chilling and characterization of solid lipid microparticles loaded with vitamin D 3. Food and Bioproducts Processing, 100, 344-350. Pelissari, J.R., Souza, V.B., Pigoso, A.A., Tulini, F.L., Thomazini, M., Rodrigues, C.E. C., Urbano, A., Favaro-Trindade, C.S. (2016). Production of solid lipid microparticles loaded with lycopene by spray chilling: Structural characteristics of particles and lycopene stability. Food and Bioproducts Processing, 98, 86-94. Ribeiro, M.M.M., Arellano, D.B., Grosso, C.R.F. (2012). The effect of adding oleic acid in the production of stearic acid lipid microparticles with a hydrophilic core by a spray-cooling process. Food Research International, 47(1), 38-44. Rokka, S., Rantamäki, P. (2010). Protecting probiotic bacteria by microencapsulation: challenges for industrial applications. European Food Research and Technology, 231(1), 1-12. Salvim, M.O., Thomazini, M., Pelaquim, F.P., Urbano, A., Moraes, I.C., Favaro-Trindade, C.S. (2015). Production and structural characterization of solid lipid microparticles loaded with soybean protein hydrolysate. Food research international, 76, 689-696. Sartori, T., Consoli, L., Dupas Hubinger, M., Cecilia Menegalli, F. (2015). Ascorbic acid microencapsulation by spray chilling: Production and characterization. LWT-Food Science and Technology, 63, 353-360. Schrooyen, P.M.M., van der Meer, R., de Kruif, C.G. (2001). Microencapsulation: its application in nutrition, Proceedings of the Nutrition Society, 60, 475-479. Ünal, E., Erginkaya, Z. (2010). Probiyotik mikroorganizmaların mikroenkapsülasyonu. Gıda Dergisi, 35(4), 297-304. Wegmüller, R., Zimmermann, M. B., Bühr, V. G., Windhab, E. J., Hurrell, R. F. (2006). 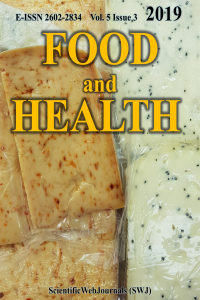 Development, stability, and sensory testing of microcapsules containing iron, iodine, and vitamin A for use in food fortification, Journal of food science, 71(2), 181-187. Yajima, T., Umeki, N., Itai, S. (1999). Optimum spray congealing conditions for masking the bitter taste of clarithromycin in wax matrix. Chemical and Pharmaceutical Bulletin, 47, 220-225. Zungur, A. (2013). Mikroenkapsülasyon işleminin ekstra sızma zeytinyağı tozunun depolanması sırasında oksidatif stabilite, sorpsiyon ve fiziksel kalite kriterleri üzerine etkisi. Ege Üniversitesi, Fen Bilimleri Enstitüsü, Yüksek Lisans Tezi, İzmir. Zungur, A., Güngör, Ö., Koç, M., Kaymak Ertekin, F. (2013). Emülsiyonların özellikleri ve emülsifikasyon koşullarının aroma ve yağların mikroenkapsülasyonu üzerine etkisi. Akademik Gıda, 11, 116-124.